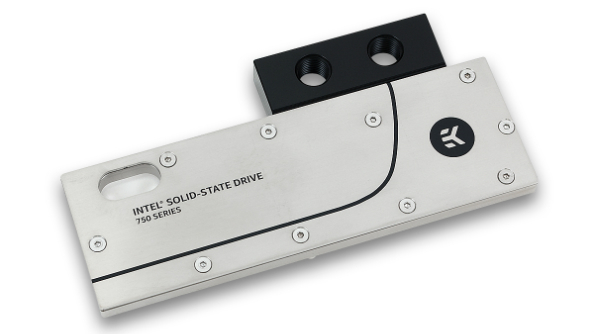 Slovenian cooling specialists EK Cooling have announced a water block for Intel’s SSD 750 Series solid state drives. Designed in conjuction with Intel, the I750 water block covers the entire PCB of Intel’s PCIe SSD for optimum cooling, and… hang on – why do you need to watercool an SSD? In short: you don’t. Firstly, solid state drives operate at really low temperatures relative to CPUs and graphics cards – the components you’d usually look to first with a watercooling solution – usually throwing out between 30 and 50 degrees celcius. Secondly, a large-scale study on SSDs concluded that heat isn’t really a factor when it comes to degradation or failure. Rather, it’s simply age itelf that degrades performance. You won’t be prolonging your SSD’s lifespan by watercooling it, nor reducing the overall temperature inside your case since the drive’s throwing out less heat than the components around it. So why does this water block exist? Well, if you really want to believe you need it, a rationale exists. Say your case fan setup means a fair amount of hot air is currently blowing over your SSD. You could either recalibrate those fans so they’re in a push/pull setup, or buy a new case with better airflow, or… watercool your SSD. Makes perfect sense. Alright, enough sarcasm. Obviously it’s an enthusiast piece of kit for those who like to push their systems to the extreme for its own sake. And I’m down with that, personally. The I750 is priced at $100/90EUR, and is comprised of a nickel-plated electrolytic copper base and stainless steel cover. Two different terminal fittings come with the I750, so you can set the cooling tubes up coming directly from the side of the block or mounted next to it, depending on how much space you have around the SSD. It’s a high-flow design, apparently, so you don’t need a particularly hefty water pump to operate it. EK Water Blocks also make a cooler for AMD’s Radeon R9 that turns it into a single-slot GPU, which is nice.